Friday, June 30-Saturday, July 1—BRANDON—Celebrate the Fourth of July at Brandon’s Independence Day Celebration Friday, June 30 and Saturday, July 1. This year the fun and events will be at two locations: Estabrook Park and Park Village, just off Route 7, north of town, as Route 7 improvements are taking place downtown. The fun begins at 5 p.m. Friday at Estabrook Park with a 50/50 raffle, preview of the silent auction, plenty of food choices including burgers and dogs, cotton candy, popcorn and more. Grab a bite to eat then bust a move at the street dance from 6-10 p.m. to the sounds of DJ Jam Man Entertainment. Bring the kids — it’s all family friendly — to Estabrook Park with parking on site and nearby, or take the convenient free shuttle from Central Park near Hannafords. The fun continues on Saturday at Park Village with a day full of activities. The annual silent auction will be available for viewing and bidding from 10 a.m.-1 p.m. in the North Campus Gymnasium at Park Village. Bid on beautiful locally made furniture, artwork, gift certificates and more. Last bids should be in by 3 p.m., with pickup 3:30-5 p.m.
Family games will be taking place, including bounce houses, a dunking booth, face painting, soap sculpting and the Swiss Roll-eating contest and old-fashioned fun, all held at the Center Green from 10 a.m.-12:45 p.m., then again 2:30-5 p.m. Other events will be karaoke for all ages from 10 a.m.-12:45 p.m.; a magic show; 50/50 raffle; vendors all day long offering food, ice cream, jewelry, clothing, and more. The highlight of the weekend is the best Independence Day parade likely to be found anywhere in the country, said organizers, headed by the Vermont National Guard 40th Army Band. It begins at 1 p.m.
After the parade, the fun continues with the Keating Five concert on the Center Green, followed by a community supper from 5-7 p.m.; DJ Jam Man 6-9 p.m.; and fireworks at dusk. For more information, contact bidcc@yahoo.com or 802-345-0056. 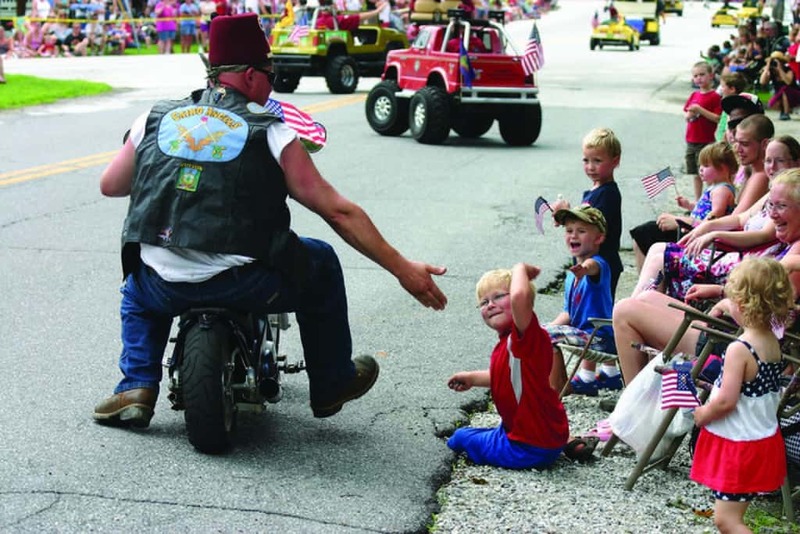 The Cairo Shriners are a crowd favorite of the Brandon Independence Day parade, riding pint-sized mobiles.